Court refuses to reconsider fraud investigation against Navanly brothers | Russian Legal Information Agency (RAPSI). MOSCOW, March 11 - RAPSI. The Moscow City Court excluded from consideration Monday an appeal challenging a decision by Russian federal investigators to launch criminal case against political opposition leader Alexei Navalny and his brother Oleg, who stand accused of fraud and money laundering, a court spokesperson told RAPSI. The appeal was excluded because it reached the court too late, but the defense will have an opportunity to refile it. Oleg and Alexei Navalny were charged last December with embezzling over 55 million rubles through the Glavnoye Podpisnoye Agentstvo (Main Subscription Agency) company, according to the Russian Investigative Committee. In December 2012, spokesman for the Investigative Committee described the charges pending against the Navalny brothers as follows: "Oleg and Alexei Navalny embezzled over 55 million rubles ($1.7 million) from a trade company... 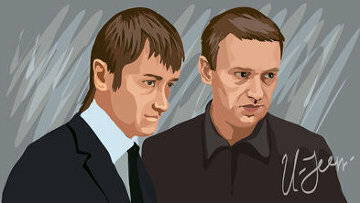 In order to legalize the illegally obtained funds, the Navalny brothers transferred over 19 million rubles ($620,850) under false pretexts from a fly-by-night company to an account belonging to Kobyakovskaya Fabrika Po Lozopleteniyu (Kobiakovo Willow Weaving Factory), also founded by the brothers." Over time it came out that the trade company referred to is French cosmetic giant Yves Rocher’s Russian operation. Investigators found that Alexei Navalny is registered as the founder and general director of a company called Glavnoye Podpisnoye Agentstvo (Main Subscription Agency), but in fact he has not had anything to do with the company's activity. While holding senior position with Russia's Postal Service, Oleg Navalny is accused of having "manipulated" Yves Rocher into entering into a contractual agreement for cargo mail transportation with the Main Supscription Agency. The enterprise transported mail from August 2008 till May 2011. While the real cost of the transportation amounted to no more than 31 million rubles ($1.02 million), over 55 million rubles ($1.8million) were transferred to the agency's account for transportation services allegedly rendered. A fraud case has been initiated against the two brothers. The maximum punishment for this crime is ten years imprisonment. The Moscow Times reported last week that after Yves Rocher came out against the Navalny brothers, dozens of bloggers and activists launched a campaign to boycott the chain. 18:38 11/03/2013 The Moscow City Court excluded from consideration Monday an appeal challenging a decision by Russian federal investigators to launch criminal case against political opposition leader Alexei Navalny and his brother Oleg, who stand accused of fraud and money laundering.